I was on my way home after a long day. It was one of those days where I expected nothing more to see and where I was happy to rest. But then a bright pink flashed my eyes and out of those pink flats popped some bare toes. Wow. For sure I started my camera immediately. I got some moments from the front, but this position was too weird for me as I stood right ahead of the girl and her friend, so I went around the bench. Personally I like the shots from behind, as I love to see the soles and I’m always hoping for some toes pinching and waving into my direction. In this case the girl did some awesome shoeplay which I hardly see at grown-ups. This is a teenager thing in general. 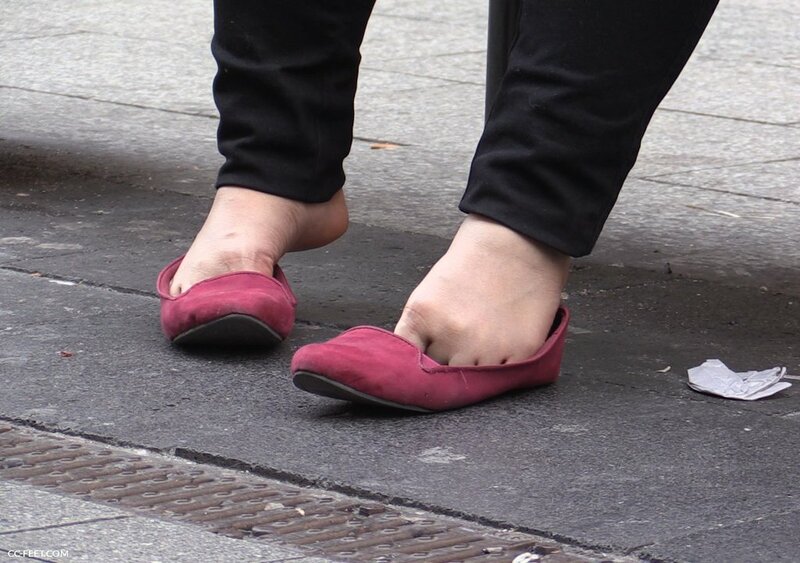 She raised her legs many times, dipped in and out of her flats, scrunched her toes, swirled her flats around and caressed the rim with her toe gaps. After a good half of the clip I changed the position again and took place at the side of the girl. From there I got some insanely good shots from above. It’s almost like you can stick your nose into those flats. In summary this is a 14+ minutes clip of a young Thai girl with amazing foot skills.